Ahh yes, the transistor. We all owe you so much. The transistor is the reason why your cell phone fits inside your pocket and why your SpikerBox can measure spikes from neurons. 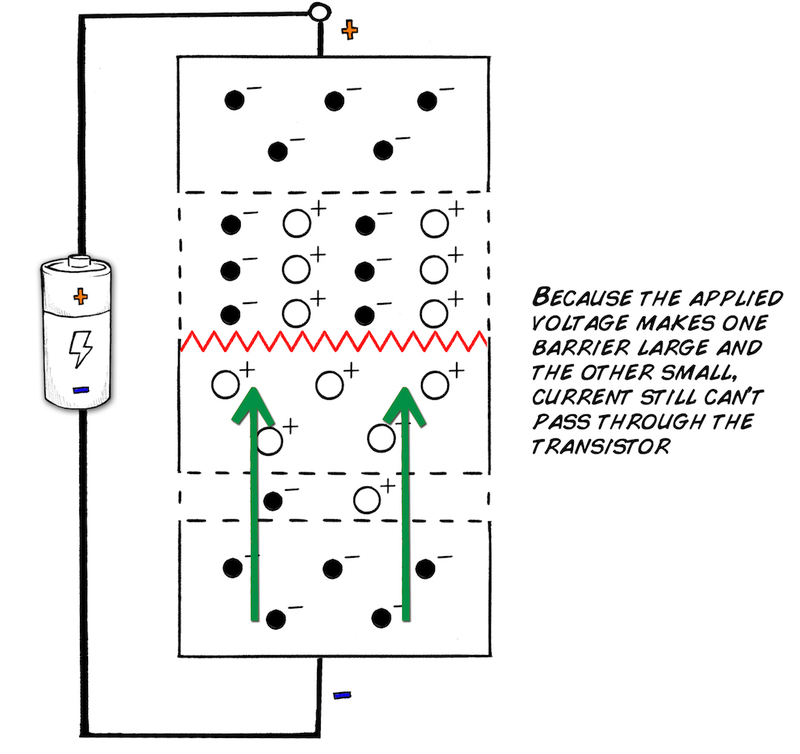 In this lesson you will learn what a transistor is and how it works. It is a complicated, lovely mix of physics and chemistry, but with patience you can learn the principles behind the transistor. 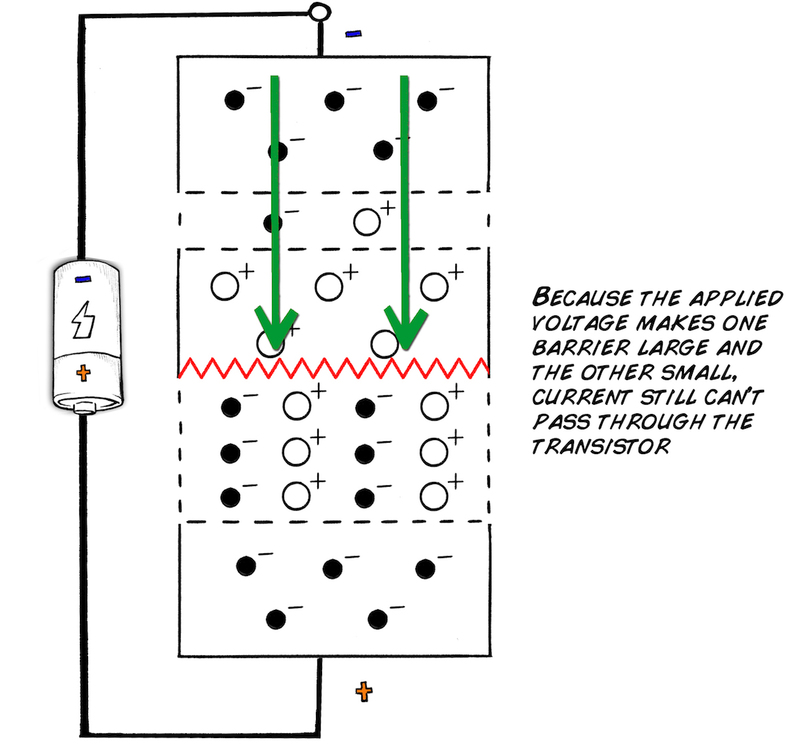 In the next lab you will use this theory to build your very own junior SpikerBox on a solderless breadboard. Modern computing and electronics are built upon the transistor, making it in our opinion the most important invention of the 20th century. Transistors are used as switches (devices telling signals where to go) or amplifiers (devices transforming "small" signals into bigger ones), and these two functions are what make your favorite mobile phones possible. Transistors can be mass produced at very low costs, and transistors are the reason that computers keep getting smaller yet more powerful every day. There are more than 60 million transistors built every year for every man, woman and child on earth. Transistors are the key to our modern world. So, if they are so wonderful, then how do they work? 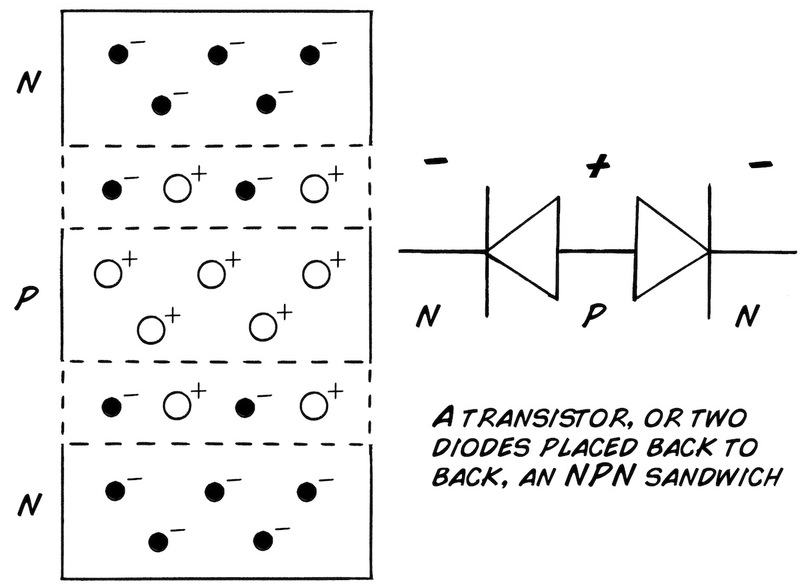 In order to understand how transistors work, you first must understand the concept of the p-n junction. The p-n junction shares some similarities with the neural lipid bi-layer (cellular membrane) that we learned about in Experiment 3. Recall, the lipid bi-layer is the barrier between the inside and outside of the cell, and it is characterized by a buildup of charged ions on both sides of the barrier. The charged ions generate a difference in electric potential that ultimately allows action potentials. Similarly, a p-n junction is the border between two materials with different charges on them. Instead of ions, the charges in a p-n junction are controlled by the presence (-) or absence (+) of electrons. Electrons have a negative charge, and the motion of these charges through conductive material is the basis of electricity. In some materials (named semiconductors) we can manipulate how many electrons are present through a process called doping, which means introducing impurities into extremely pure semiconductors. Get out your periodic tables, because this process is only possible due to the chemical properties of certain elements. Semiconductors come from what was known as Group IV of the periodic table, which includes carbon, silicon and germanium. Science fiction has often referenced these elements, because their properties make them such a key aspect of both biological and machine-based systems. Each Group IV element has four electrons in its outer energy level, but it can ultimately hold up to eight electrons. This is key, because these Group IV elements can then form four-way covalent bonds in a crystal lattice so that each atom's outer energy level is stable. 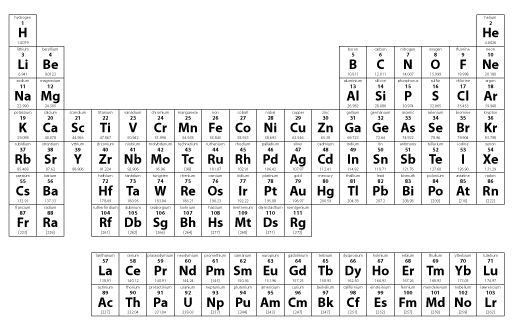 Group III elements (such as boron or gallium) have three electrons in their outer-most electronic shell, while Group V elements (such as phosphorus or arsenic) have five electrons in their outer-most electronic shell. Elements from both of these groups can also form covalent bonds with electrons. If you take a block of a pure Group IV element like silicon and zap it with some Group III atoms like boron, the boron will attempt to fit into the lattice. However, since the boron only has three electrons in the outer shell, one of the four silicon neighbors in the lattice will be short one electron in the covalent bond. Thus, the bond will have a net positive charge (absence of electron), which can attract and accept an electron from a neighboring bond. Group III atoms are known as acceptors. Doping a semiconductor with acceptors will generate an excess of these absences-of-electrons (known as holes), which results in the appearance of a surplus of "positive" charges in the material, leading to this material being called "positively-doped" or "p-doped". As you might conversely expect, when Group V elements like phosphorus that have five electrons are added to silicon, this forms bonds with an excess of electrons. Group V atoms are thus known as "donors". Doping a semiconductor with donors will generate a large concentration of negatively charged electrons, making the material "negatively doped" or "n-doped". Both p-doped and n-doped semiconductors are relatively electrically conductive on their own, but what happens when you put a block of p-doped semiconductor next to a block of n-doped semiconductor? 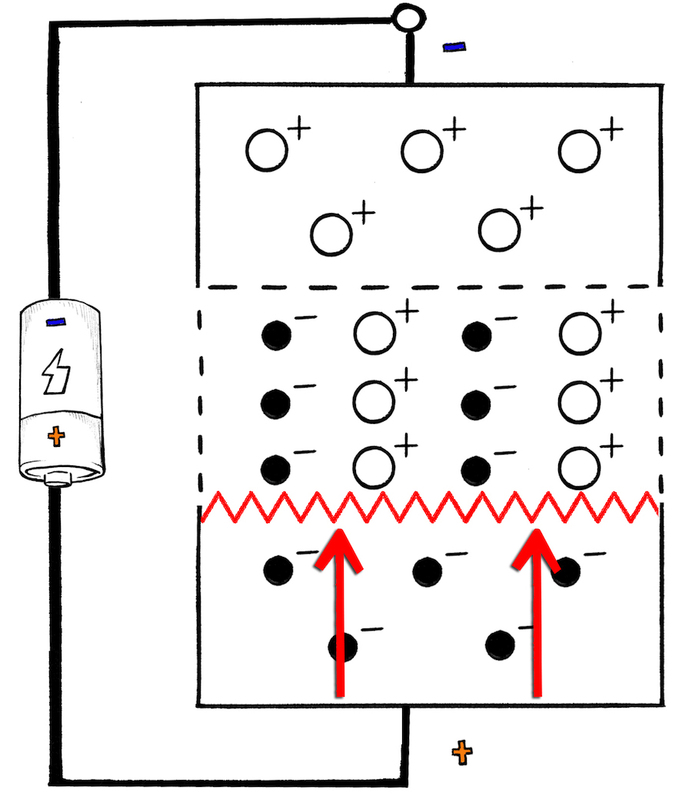 The electrons in the n-doped material are attracted to the positively charged p-doped substance, and the excess electrons and positive charges meet in the middle at the junction between the two blocks. When the electrons and holes meet, they cancel each other out and form a layer that is depleted of charges, or a depletion layer. Like the neural bi-layer, the resultant electrical potential properties of the p-n junction allow many functions. The depletion layer, due to the lack of free charges, is non-conductive without an applied external voltage. 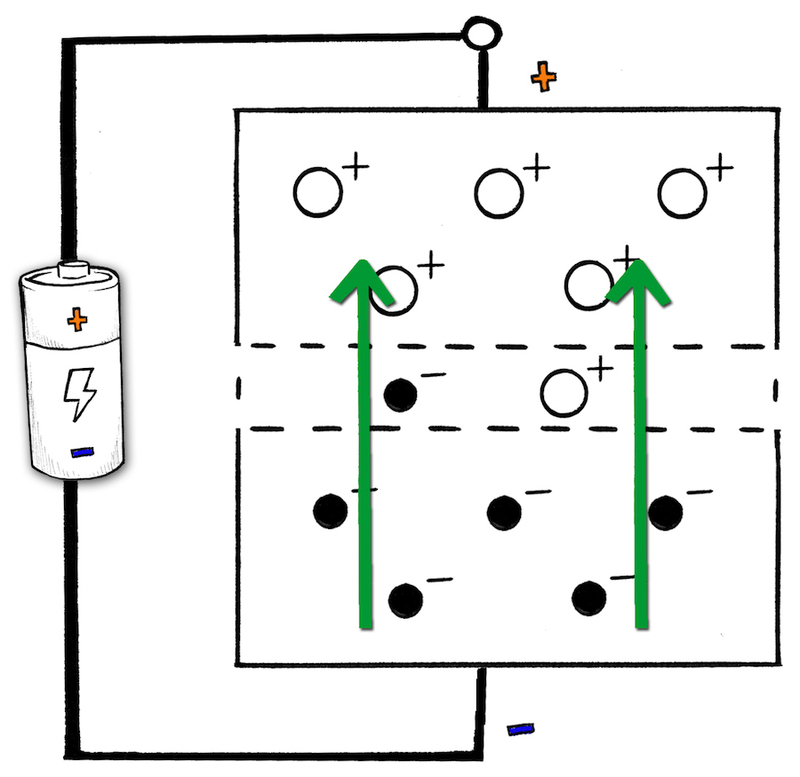 If the p-doped side of the p-n junction is connected to the positive voltage and the n-doped side with the negative voltage of a battery, this results in a lessening of the electric potential barrier and allows electrons to cross the p-n junction, which results in electric current flow. This process is called forward bias. 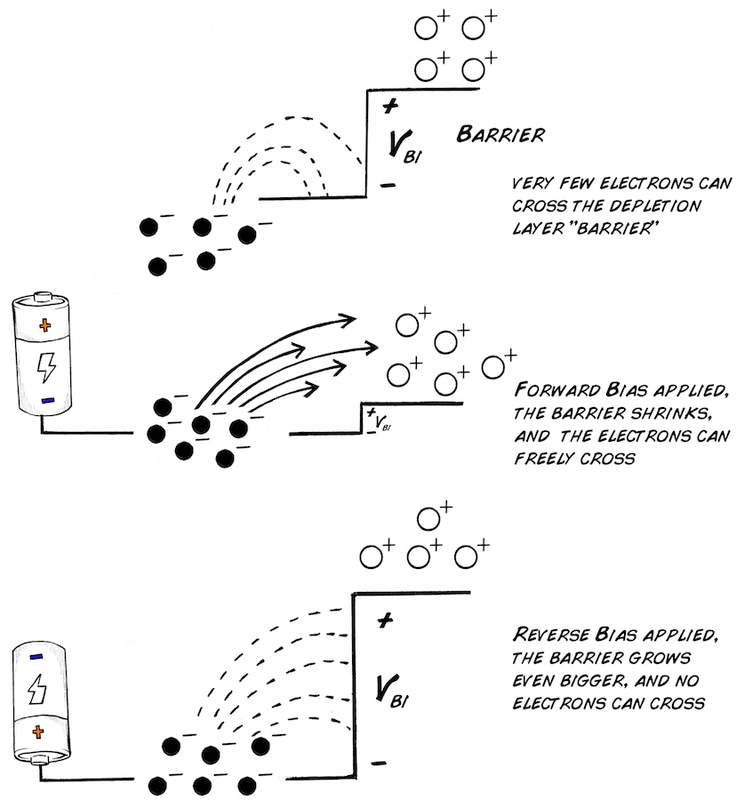 If, on the other hand, the p-type semiconductor is connected with the negative voltage and the n-type with the positive voltage, the electrons and positive charges (holes) are pulled further away from the depletion region, which results in a larger electric potential barrier that behaves as an insulator. This is called reverse bias. Thus, p-n junctions are therefore commonly used as diodes, which are devices that allow electricity to flow in one direction but not in the opposite direction. Importantly, diodes only allow one-way current through if a certain voltage is reached, or "forward voltage." 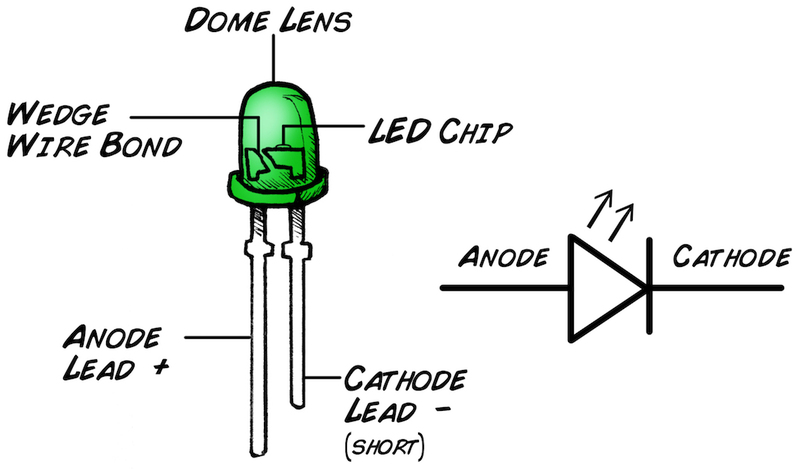 Some diodes release light with the current passes, hence the name "Light Emitting Diode" or "LED." Now that we understand how p-n junctions and diodes work, what would happen if you made a "sandwich" with one block of p-doped material placed between two blocks of n-doped material? We now have a device with one "n-p" junction and one "p-n" junction that acts like two diodes* placed back to back. What would happen if you applied a large voltage across the whole sandwich? We didn't generate any current flow! What if we reversed the battery? With the diodes back-to-back*, the applied voltage, no matter what direction it is in, will always reverse-bias one of the diodes and prevent current flow. But...hold on ... what if we add a smaller voltage to the terminal of the p-block? What then? The top n-p junction, which is reverse biased by the main battery voltage, prevents any current flow. But, forward-biasing the lower p-n junction with the smaller voltage causes a huge number of electrons to shoot into the p-block. 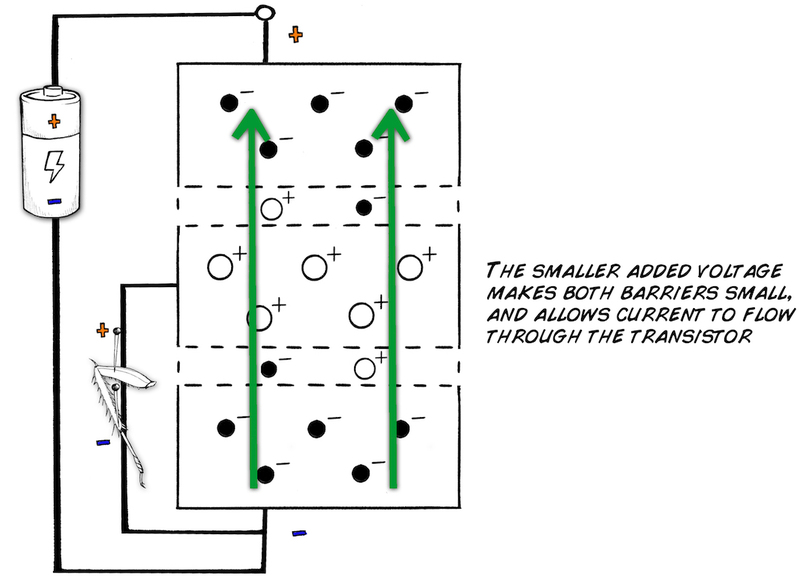 This has the effect of lowering the current flow barriers in both depletion layers, and we get an exponential increase in electrons that can travel through the transistor. We've got current! The "bipolar junction transistor" is the real-world component of this sandwich. There are two varieties, the "PNP" and the "NPN," but we will focus on the more common NPN configuration. In an NPN transistor, the three terminals are named the emitter (first N-block), the base (P-block), and the collector (second N-block). Now we know how a transistor works, but why is its function important to our mission to learn about neural action potentials? A neural action potential has an extremely small voltage that needs to be amplified to be observed. If we set up our NPN transistor so that our little neural signal goes into the P-block (the base) and our large voltage (battery) going across the two n-blocks (collector and emitter), we have an amplifier! 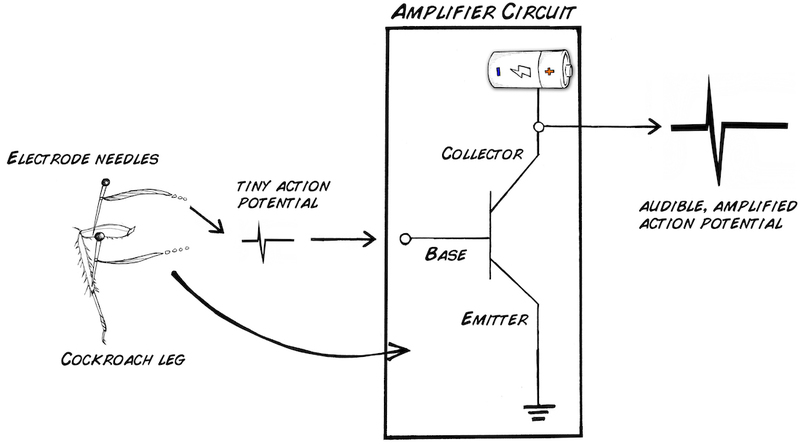 If we then monitor the current between the collector and emitter, we should a see a signal that looks just like our action potential ...but a lot bigger! Building a circuit to do this is slightly more complicated than simply hooking up a neural signal, a transistor, and a battery, and we will go through this in the following write-up. But....If we build the circuit correctly, we should be able to amplify that tiny action potential signal enough that we can hear it through a simple speaker. And the world of neurons is ours to study. *Note: Unfortunately, you can't simply buy two RadioShack diodes and place them back-to-back with solder to make a transistor. 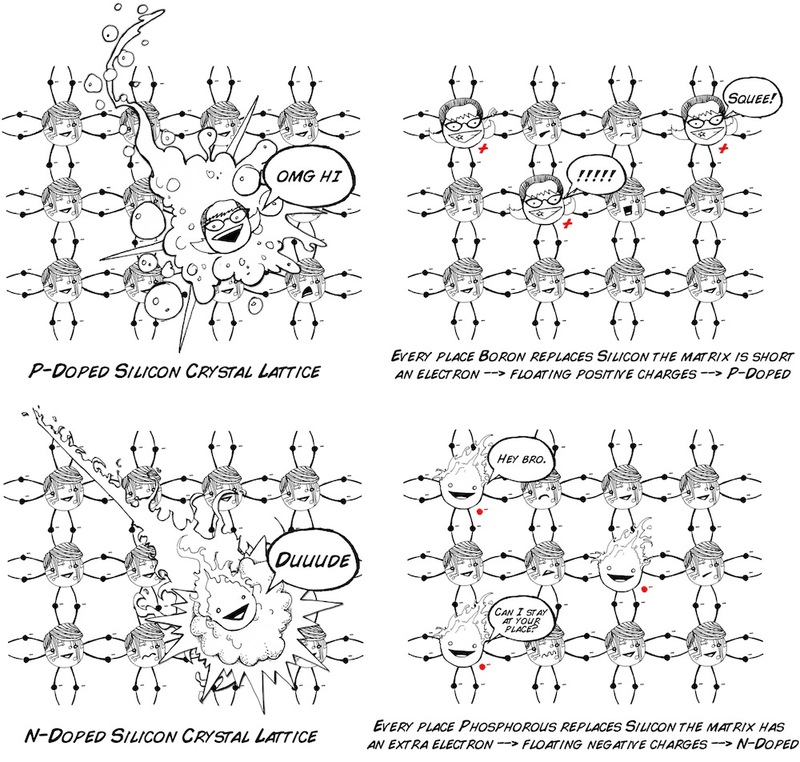 The effects described above happen at the crystal lattice level. Why are the Group IV elements called "semi"-conductors? Do they conduct at all times? If not, what must be done to them to make them conduct? What happens when Group III atoms are added into a block of Group IV material? What about when Group V atoms are added to Group IV instead? 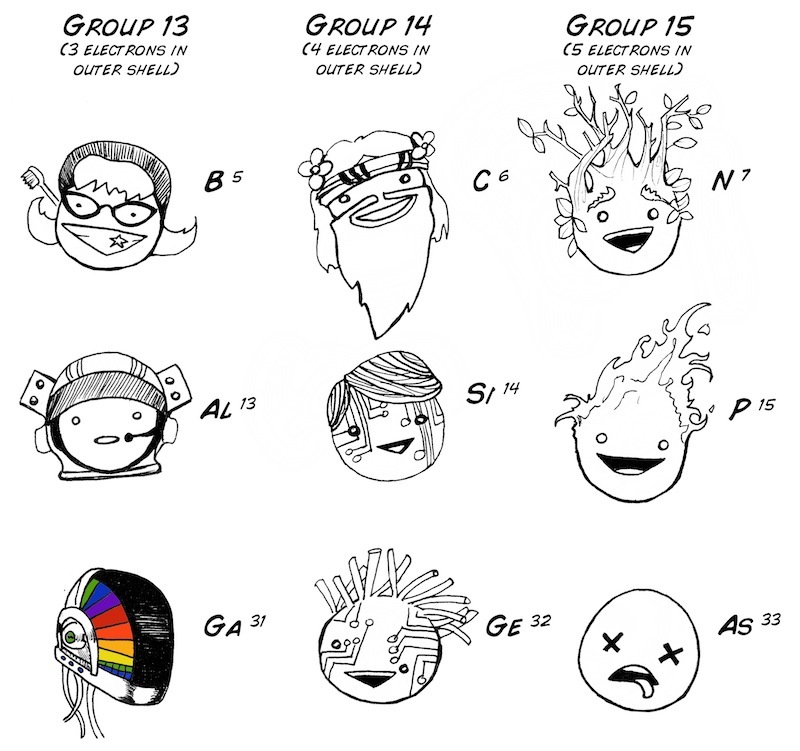 What do you think would happen if you just mixed Group III and Group V atoms? Do you think the resultant mix would be conductive? In our temperature experiment we learned about the electro-chemical interactions that occur at the cellular membrane. How is a p-n junction similar to the lipid bilayer of a cell? How is it different? How do diodes relate to transistors?